Here's the December bulletin board decoration for church. 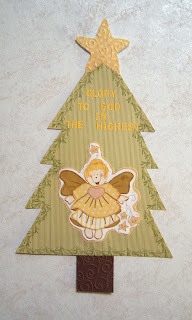 The angel is a paper piecing from Annie Lang's 202 Paper Piecing. I stamped a branch all around the tree to give it the pine look - added a star, tree trunk, and punched out letters to finish it off.